'Beili Blues' is a pedigree flock of Blue Texel sheep owned by Dylan and Bethan Jones, Beili Bedw farm which is situated in the rural village of Llanllwni in the north of Carmarthenshire, between the market towns of Carmarthen and Lampeter. Beili Bedw is where the flock name of 'Beili Blues' was derived from. The farm which has been in the family since 1972 was originally farmed by Dylan’s grand-parents before being taken over by us in 2006. The farm is around 120 acres, all of which is grassland, and rises from around 600ft to 750ft above sea level. 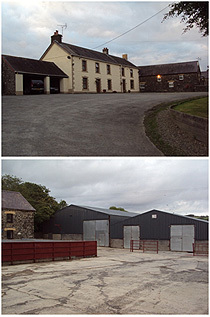 The farmyard comprises of numerous traditional stone buildings in the shape of a courtyard, used for milking in the 70’s and 80’s, as well as the more modern agricultural sheds, originally built for housing cows. These have now been converted into a more suitable environment for sheep farming. We also rent a further 180 acres in nearby areas, which allow us to keep 1,200 commercial sheep as well as our small flock of Blue Texels. We are Blue Texel Sheep Breeding specialists in Wales.